Water bath canning can be used to safely preserve high-acid foods like jams, jellies, pickles, salsa, tomatoes, and fruits. 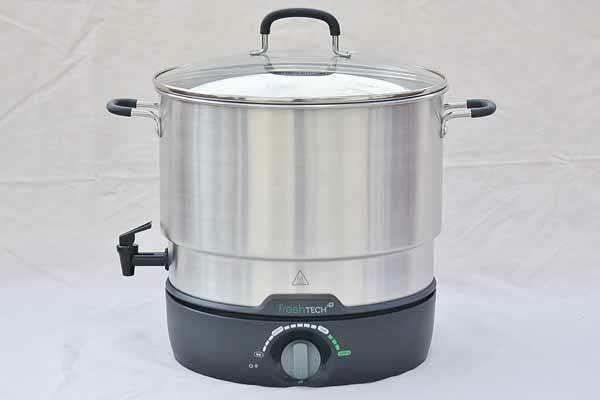 This Ball Electric Water Bath Canner and Multicooker can be used anywhere with an electrical outlet, freeing your stove top and making canning easy! An included steaming rack allows you to perfectly steam fresh vegetables, and a convenient spigot makes serving hot cocoa, coffee, or apple cider a breeze! Other features include a detachable base, detachable power cord, and a glass lid with a handle. Note: This canner comes with a user manual and starter recipe book. Note: This canner includes a 1-year limited warranty.